The Rev Tom Christmas is the new vicar of St Nicholas Church in the lovely, if sleepy, little village of Thornford Regis in South Devon. Tom, still haunted by the tragedy that has left him a widower and his nine-year-old daughter motherless, soon finds that this idyllic village is not the refuge he had hoped for. He had been ordained at the “vicar factory" in Cambridge and then moved on to become a curate in south London before serving in an inner-city team ministry in Bristol. He could still remember “the disquieting sensation in Bristol of having fallen out of love with God and, worse, the sensation that God had fallen out of love with him, and wanting desperately to rekindle the romance. He had learned since then in prayer and contemplation that faith is always only reaching towards an approximation." He prefers to avoid being called "Father Christmas", reflecting that “the mercy was his late wife hadn't been named Mary". In fact she had been a Jewish doctor. "Tom thought that faith grounded you to the world" and was pleased that his sister-in-law and daughter had both begun attending synagogue in Exeter. Tom had once been a professional magician called the Great Krimboni. It was while working on a cruise ship that he had developed appendicitis and, while recovering, “had time to consider whether I wanted to spend life on a luxury barge doing little more than amusing people .... or whether I couldn't be of service in some other way. So when I returned to Southwark, I started going to the Cathedral, and before long - " he was ordained! It doesn't sound a very convincing reason for such a drastic step. "Vicar! Jesus did not say that!" “He might have. Much went unrecorded." C C Benison is the non de plume of Doug Whiteway, who was born and still lives in Winnipeg, Canada. He was awarded a BA in Religious Studies from the University of Manitoba, and a degree in journalism from Carleton University in Ottawa. He has worked as a writer and editor for newspapers and magazines, as a book editor, and as a contributor to non-fiction books. He started writing mystery fiction in the 1990s with Death At Buckingham Palace, and followed this with other novels. Twelve Drummers Drumming starts with the May Fayre in the Devon village of Thornford Regis, when the bludgeoned body of Sybella Parry, the beautiful 19-year-old daughter of the choir director, is found hidden in a huge Japanese ceremonial drum. Had Sybella, the blurb asks, with her "apparent affinity for Goth and the black arts, and her rumored drug use, attract(ed) a shady element that led to her distressing demise?" The words distressing demise are an instant giveaway: we're not expected to take the story too seriously. The village with its sundry unlikely characters together with two stereotyped policemen (called Bliss and Blessing!) seems an unlikely choice of setting for a Canadian author, but most of the vocabulary seems appropriate, although no one in England would use the American term homicide. And the pop star is Simon Le Bon not Simon Lebon. The previous vicar had mysteriously disappeared and when his dead body also comes to light, Tom becomes involved in this mystery too and soon has accumulated quite a list of suspects, including Sebastian John, his strangely secretive verger, Mitsuko Drewe, a local Japanese artist, and irritable Colonel Northmore, aggressive survivor of a Japanese prison camp. 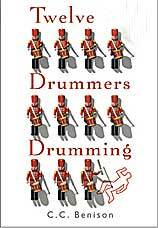 There are twelve drummers too but once they've served their purpose (to provide the book's title) they are soon forgotten about. The story is partly told by the lengthy letters typed out every day by Tom's housekeeper, Madrun Prowse, to her mother, describing what is going on, complete with crossings-out whenever she sees a chance of expressing things better, or sees a need to correct one of her infrequent spelling mistakes. These letters are all printed in italics. Why the publisher didn't use a typewriter font isn't clear. Tom Is nothing if not observant. It is he who notices that the Japanese artist's husband, Liam, has given him “just for the time it takes to split a second, a flash of the purest, blackest hatred". His wife had “a flicker in her eyes  sharp and bright, like a match struck in a black cave. He (Tom) was certain it was fear." He also "caught, just for a moment, the desertion of a devilish twitch to the Colonel's stone face, the end of a smile so fleeting, so uncharacteristic, he had to remind himself that it had been there." Even Madrun had “a strange, alert look in her eyes". Another possible suspect had eyes that were “empurpled like bruised fruit. More arresting than this were her pupils, needle sharp and dangerous.“ Sebastian displays “a gush of inner light (which) would illuminate his deep-set blue eyes and a faint smile would curl the corners of his mouth, illuminating the suppressed intelligence", and “Tom was processed by the worrying notion that it had been relief, or something akin, that he'd glimpsed in those cobalt blue eyes." This preoccupation with eyes ends up by being rather too much of a good thing. The author also believes in keeping us waiting by ending chapters with sentences like “It was his verger, Sebastian John, and he was as pale as the whitewashed wall of any cottage in the village." This is on page 41. Then we have to wait until page 59 to discover why - and it turns out to be something that we already knew. The plot does not seem very probable, as when a doctor, after being told that there was a dead body in the drum does not even bother to check that the victim is really dead. And the final explanation of the murderer's motives relies too heavily on coincidence. All in all, it is an unlikely tale, told with some welcome humorous touches, but not enough to make it really memorable. The author has his own website and there is an interview with him on the Publishers Weekly site. The cover looks effective enough even if these are not the sort of drummers who actually appear in the story. It was the carol The Twelve Days of Christmas that had given the author the idea for a series of detective novels, of which this was to be the first.